Growing up I spent four summers working at Cohutta Springs Youth Camp. Those summers are filled with wonderful memories, many of them with the camp directors children, Kaleigh, Breck, Aubrey and Colton. 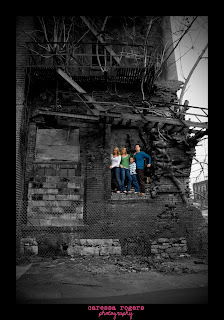 A couple weeks ago they requested that I take picture of them for their parents christmas present. So today we ventured downtown Chattanooga for our session. It was so easy to come up with poses that were uniquely them. I was excited when we happened upon a warehouse that had "The Camp House" written on it. How perfect for these siblings who have grown up spending their summers at camp. Besides loving camp the Langs share a love for gymnastics. 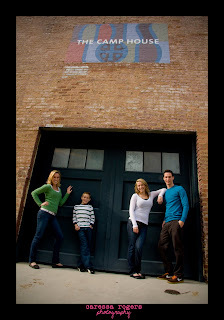 So when we came to the old building (pictured above) my subjects wanted to have a picture taken up in the doorway. Before I could ask them how they planned on getting up there, they were doing gymnastic pyramids and climbing right up. Thanks Kaleigh, Breck, Aubrey and Colton for another memory together. Caressa, I can't believe that I am JUST reading this. This is too precious! =) Thanks a million times over for doing this photo shoot with us. Not only was it a fun time, the pictures turned out to be some of the best pictures of us sibling EVER! And it was a great Christmas gift. Mom said that it's the best gift she's ever gotten from us!